You can use GWRC mapping tools to find property, geographical, recreational, locational information and more! To browse our map collection, try the links listed below. In the summer season, you can use this map to see the most recent bathing water quality information for popular bathing sites. GIS data is freely available to the public through our download service. Download our map data or connect to web map services to reuse our GIS data. Search for and download GIS data for your own use. Colour aerial imagery acquired for the region in 2013 and 2017. Regional LIDAR DEM acquired for the region in 2013-14. Regional GIS data shared on the Koordinates Data Service site. Developers looking for mapping data can download our layers and API's by going to our Data Services page. All data unless specifically stated is licensed under a Creative Commons Attribution 4.0 International License. ADVISORY Access to mapping pages & services has recently been updated to use secure http connections (i.e. https:). Please update any browser bookmarks to use a secure http prefix for these pages, e.g. https://mapping.gw.govt.nz. Apologies for any inconvenience. ADVISORY The original "Advanced" map viewer uses Adobe Flash software which is being retired by Adobe and browser suppliers. GWRC will continue to host this legacy viewer whilst it remains of use to the public. 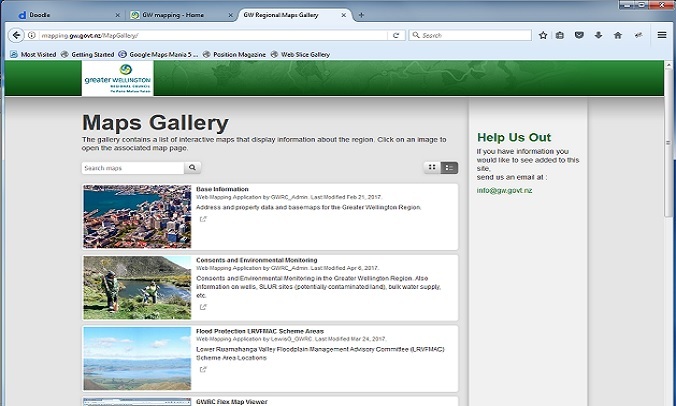 We recommend use of our other HTML viewers listed in the GWRC Map Gallery. Recreational trails mapping page released. Includes walking, tramping and MTB routes in the Wellington Region. The tools reveal the projected future of climate change in the region, based on modelling by NIWA for GWRC. 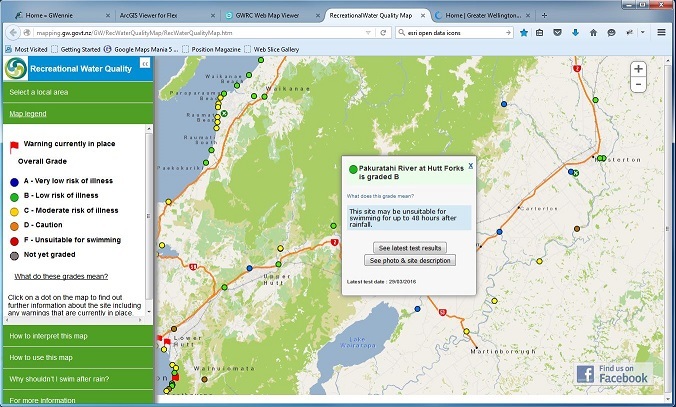 A new live environmental monitoring mapping site is now available to view. A new flood hazards mapping site is now available to view. Some other sites of interest to GIS Users are listed below. All of these sites provide options for data discovery or data supply. 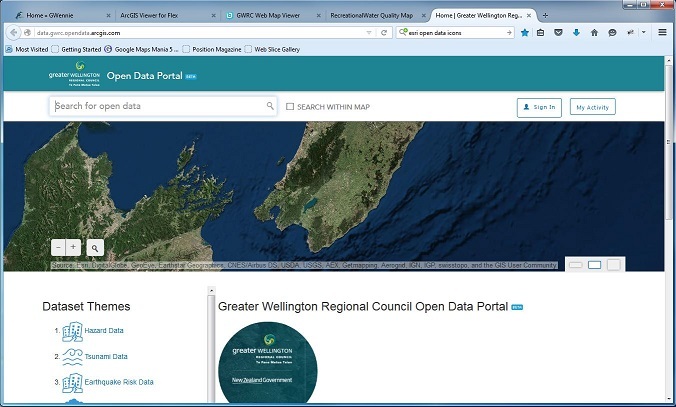 Many of our partner councils in the Wellington Region provide online GIS mapping systems for public use. These sites are listed below. Tell us what you think of our site, the tools on the site and anything else you want to tell us. We are interested in your ideas and views to improve this site or it's tools and welcome your feedback.